Honduras has been long dominated by a handful of some ten to fifteen wealthy families. Everyone here knows their names – Facusse, Ferrari, Micheletti – and now they are scrawled on walls everywhere, next to accusations of golpista (coup-supporter) and asesino(assassin). These oligarchs used to be satisfied by controlling the economy and buying off the politicians, but they now increasingly insist upon exercising direct political control themselves, and their names show up more and more in congress, in the supreme court and now even in the executive branch. In addition to the 18 military bases it established and the 10,000 American troops stationed there, the U.S. also provided the Honduran armed forces with over $100-million between 1980-84. This infusion of money and technical support to the military and business elite reinforced the strength of the oligarchy in Tegucigalpa and led to dramatic increases in poverty, inequality and political repression. The 1982 constitution was written after decades of military dictatorship while Honduras was playing host to a U.S.-led paramilitary contra force of over 15,000 soldiers trained in what we now call ‘counter-insurgency’ – specializing in campaigns of terror against primarily poor and ill-equipped guerilla forces and their supporters. During that period, according to Joan Kruckewitt, “the use of repression, instead of concessions and reform, became the norm” and that “the military emerged from the period of U.S.-led militarization as the most powerful sector in the country, with few checks and balances to restrain them.” Indeed, between 1981-84, while the new constitution was being written, ratified and established into political order, the military carried out 214 political assassinations, 110 ‘disappearances,’ and 1,947 illegal detentions. The foreign and local elite who have turned the islands, and most of their inhabitants, into tools for their personal profit have been the most vocally supportive of the coup. They pump out misleading or, at best, willfully ignorant anti-Zelaya rants everywhere they can, notably on internet news sites; my own reports have been consistently attacked and, in one instance, they even went as far as to threaten my life. These attacks are most likely motivated by the insistence of the social movements for tax reforms that would bring a share of their profits back to the state for the purposes of re-distribution through increased support for education, housing, health care and other social programs. Foreign-owned companies currently operate in an almost-entirely tax free environment, one of the many grievances that the proponents of the constituyentewere hoping to redress. Given the context described above, it is hard to imagine how anyone could seriously claim that ‘the event’ on Nov. 29th could be called a free or fair election. 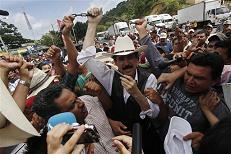 On the day of the vote, the Frente urged Hondurans to stay home and boycott la farsa(farce). And that is precisely what happened – on a day that is normally a boisterous street party filled with red or blue flags representing to the two primary political parties, Honduras was quiet and subdued. Most polling stations had more military and police than civilians. The TSE itself admitted that only around 1.7 million people voted, in a country of nearly 8 million, with 4.6 million eligible to vote. That makes a turnout of around 35%, the lowest since the end of military dictatorships in the early 80s. Inexplicably, on the night of Nov. 29th, the TSE announced a projected turnout of 60%, which became the number repeated in almost every international news source. Fox News in the United States was one of the few exceptions, reporting the absurd figure of 70% – no one has yet been able to explain where that number came from. Tyler Shipley is a doctoral candidate and activist from Toronto, Canada. He did research and human rights observation in Tegucigalpa with a delegation organized by Rights Action, reporting on the resistance to the coup and the Nov. 29 elections. The entire photo essay “Honduras Police State – A Week In Pictures” is at available at toronto.mediacoop.ca. 1. Joan Kruckewitt, “U.S. Militarization of Honduras in the 1980s and the Creation of CIA-backed Death Squads,” in Cecilia Mejivar and Nestor Rodriguez, When States Kill: Latin America, the U.S., and Technologies of Terror, University of Texas Press, Austin, TX, 2005. 2. Official Statement by representatives of CODEH, COFADEH, FIAN, CDM, CPTRT, CIPRODEH to the TSE, Nov. 28, 2009. Translated from Spanish. 4. Statement on the National Elections in Honduras, Washington Senior Observer Group, December 1, 2009. 5. Peter Kent, “Canada Congratulates Honduran People on Elections,” December 1, 2009.